When I was designing Reagan’s room, I knew I wanted to have some fun pops of color throughout it. 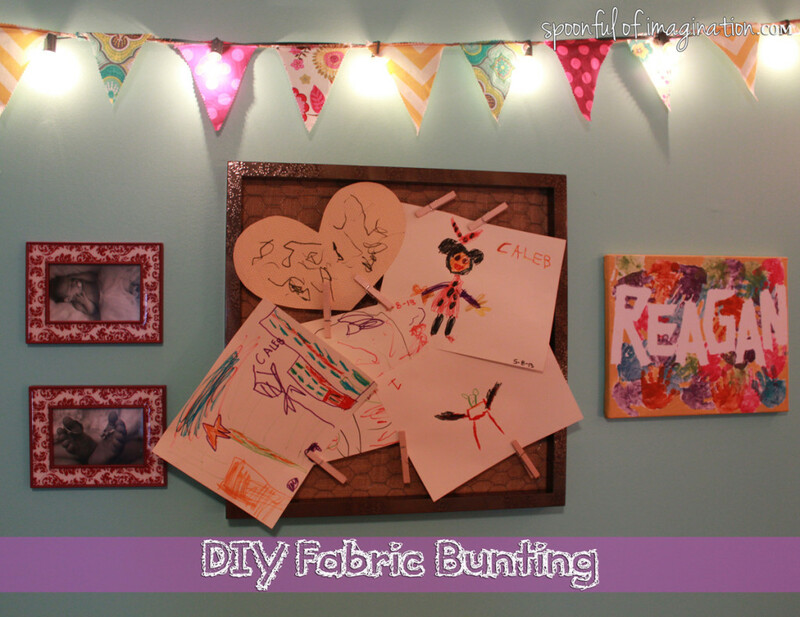 I thought fabric bunting would be a fun way to do this without costing a lot of money or creating something to dominate. I want to quickly show you how I created it, so you can do it too. I believe the way I did it might be one of the easiest sewn ways. 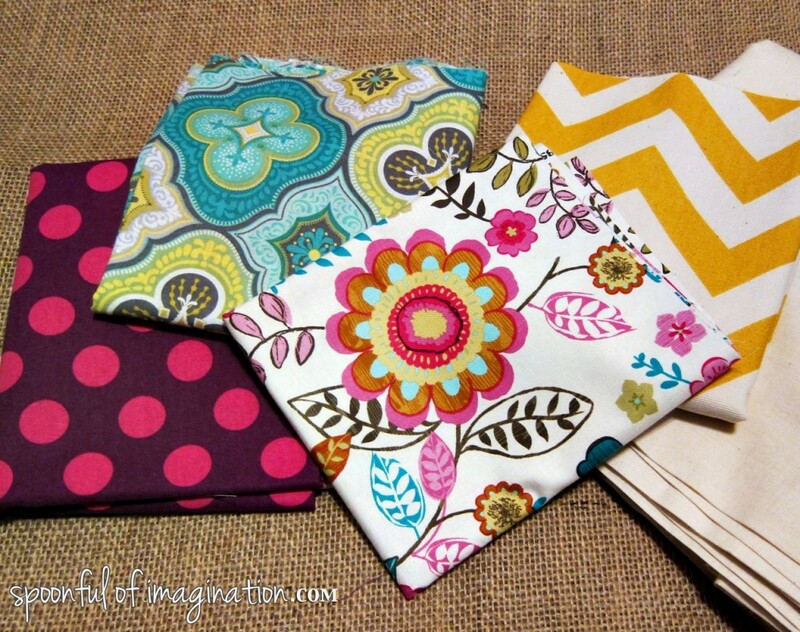 I first went and got a few fabrics that I loved and were colors that I was incorporating in her room. I got 1/3 a yard of each of the fabrics. 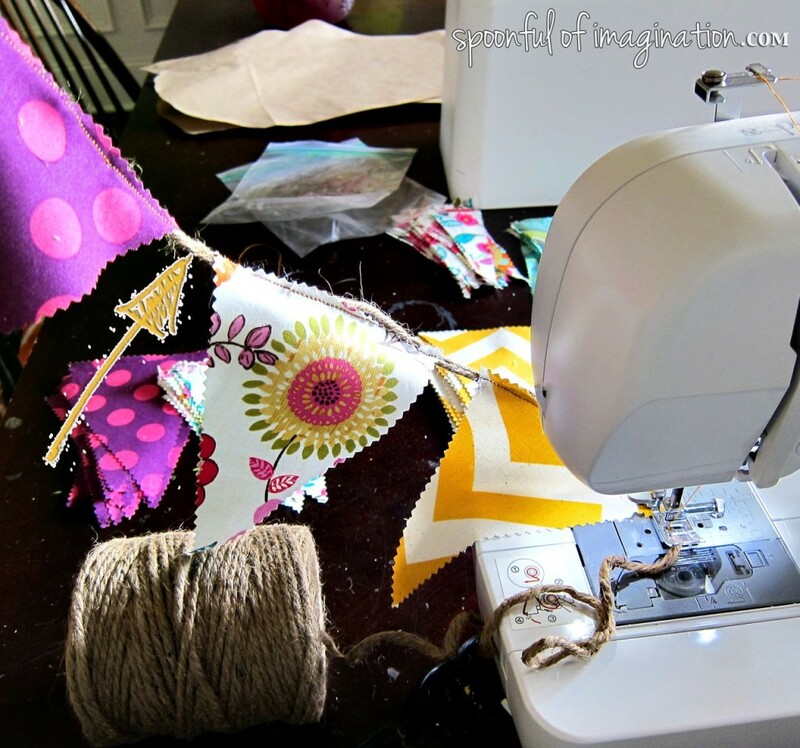 You could easily get more (depending on the area you want your bunting to wrap) or just use a bunch of different scrap fabrics you have on hand. You then decide how big you want each of your “triangles” to be. I didn’t want mine to be too large. I decided I wanted them to be about 5″x6″. I measured my fabric and cut out a bunch of rectangles this size. 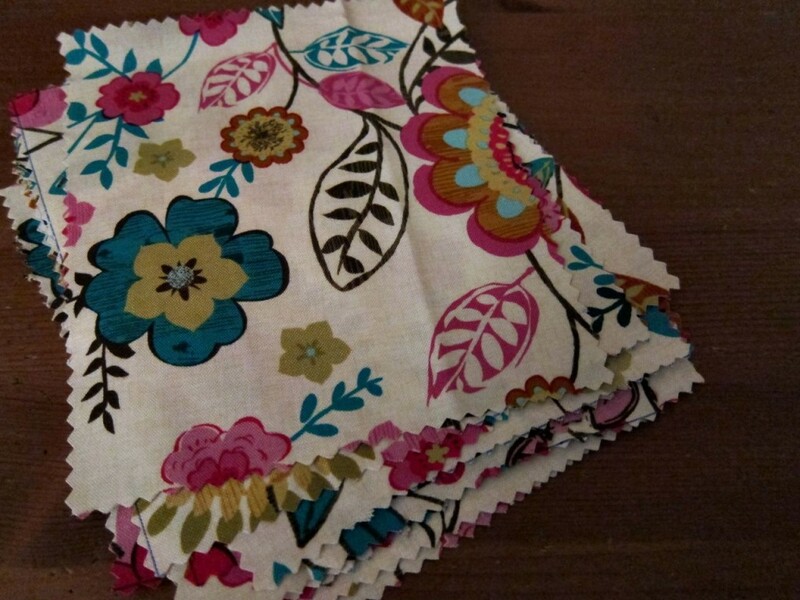 I have seen a lot of ways of creating bunting to have the fabric double-sided with a nice sewn edge. I didn’t want to spend that amount of time on this project. It would have been like making a ton of little pillows as each triangle would have been sewn inside out than flipped right side out and iron pressed to go flat. In my opinion, the difference in look is not worth the extra time spent to have something that gives the same effect. I simply used my pinking shears to cut my fabric. The pinking shears allow the raw unfinished edge to not fray as bad and created a nice added look in the mean time. Once all my rectangles were cut, I start cutting them into triangles. I simply folded each rectangle and used a pen to mark the center of that rectangle and then cut from that point to one of the opposite corners. As I went on, I even stopped measuring for the center but just eye-balled it. It doesn’t have to be perfect. No one will be able to tell if you are a few centimeters off. 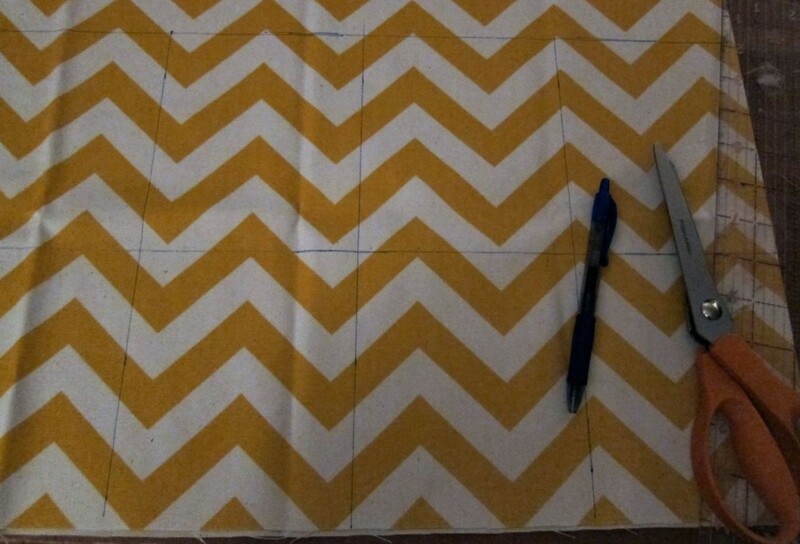 One tip to consider when cutting your triangles: Take a minute to think about which way the “fat” end of your triangle would look best (depending on the print of your fabric). In the triangle cut above, I would have cut right across the pretty green flower if I have cut my triangle from the other end. 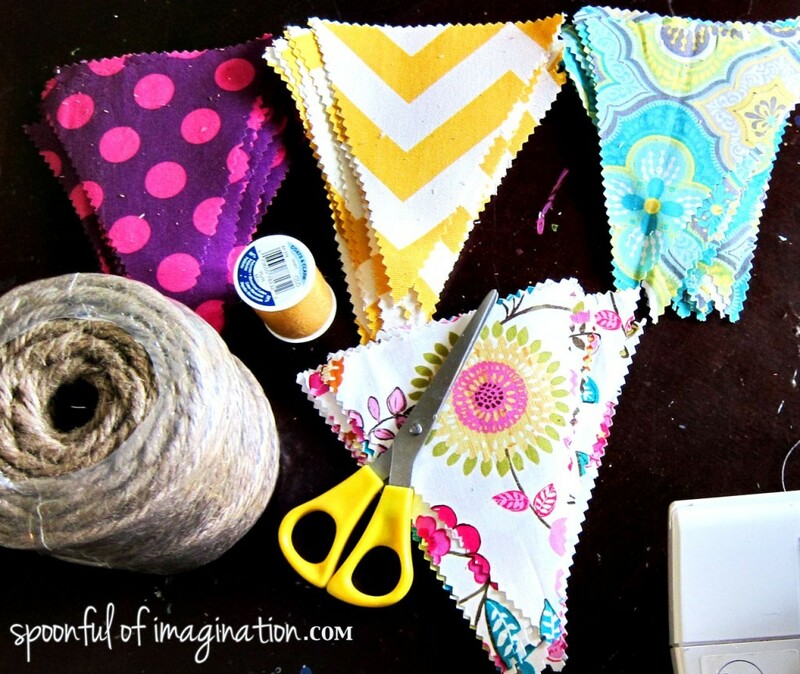 After all your fabric is cut, you are ready to sew your bunting together! I sewed my triangles onto a thick jute rope because I wanted a more rustic look. 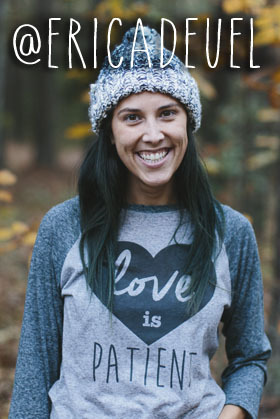 You could sew yours onto ribbon, yarn, or just about anything! 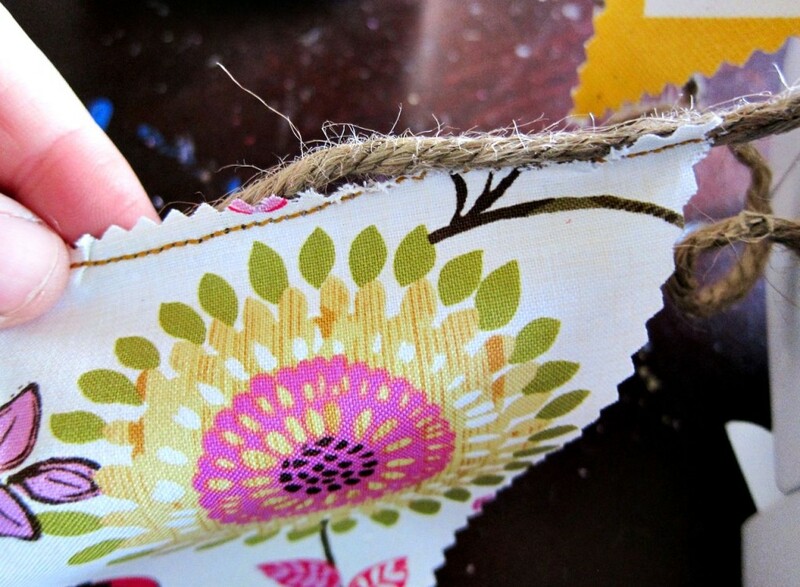 If you decide to use jute rope as well, make sure your fabric hangs over the rope edge just a little as you sew. The rope will want to roll and you don’t want to create “holes” in between where your rope and triangle meet (as shown below). 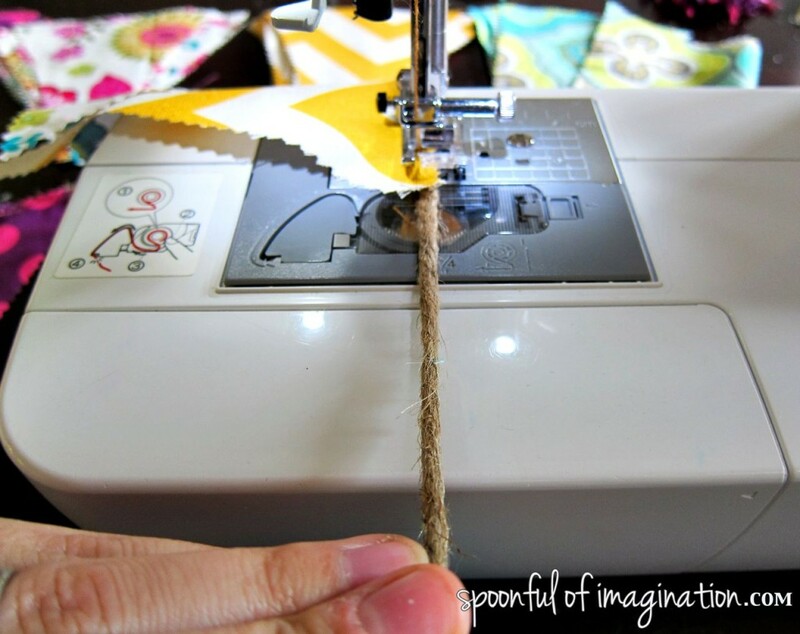 Another tip is to pull your rope tight as you sew, so it does not turn around. I knew I was going to wrap my bunting around clear outdoor lights to hang in my daughter’s room, so I left a bigger gap in between my triangles (for room to wrap around the bulb-ed wire and hide it a little bit). It depends on the look you are wanting to create how far apart you space your triangles as you sew them onto your rope/ribbon. Once you have sewn all your triangles, you are done! 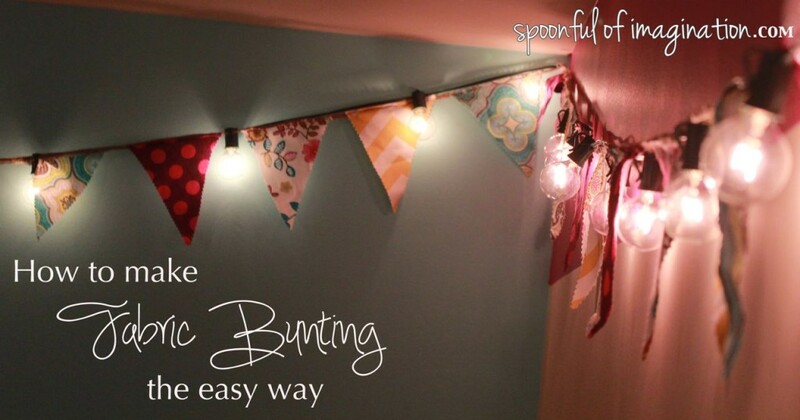 It is easy to go back and add more on, if your bunting ends up to be shorter than you would like. My bunting was a little short and didn’t cover the electrical cord like I wanted, so I just made another small strip and sewed it on. 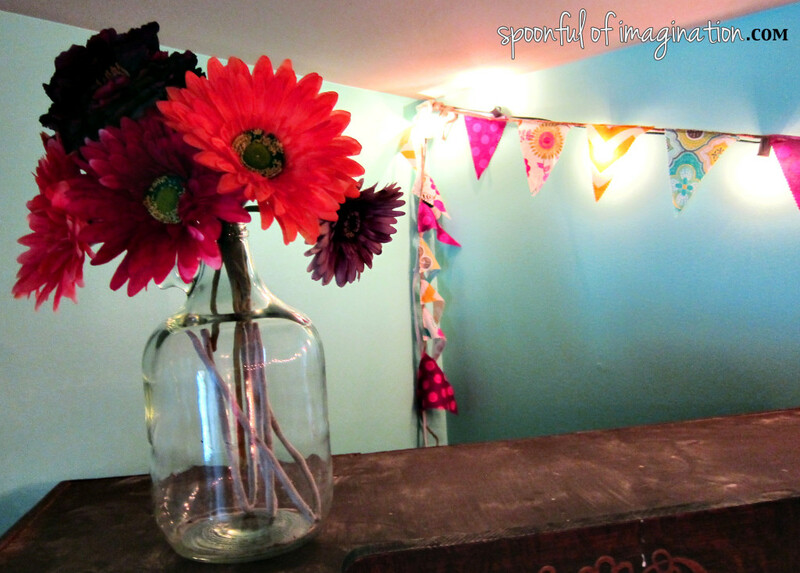 The final step is to hang up your bunting and enjoy it! I love the simple yet fun look it creates! For more pictures of Reagan’s room, please go visit her Minnie Mouse Bedroom Reveal! Thanks so much for stopping by, and I hope I just gave you a quick DIY that you want to do! Cute!! I’d have to do a “no-sew” version, since I don’t sew (I know, I know…). Love all the fresh patterns and colors! 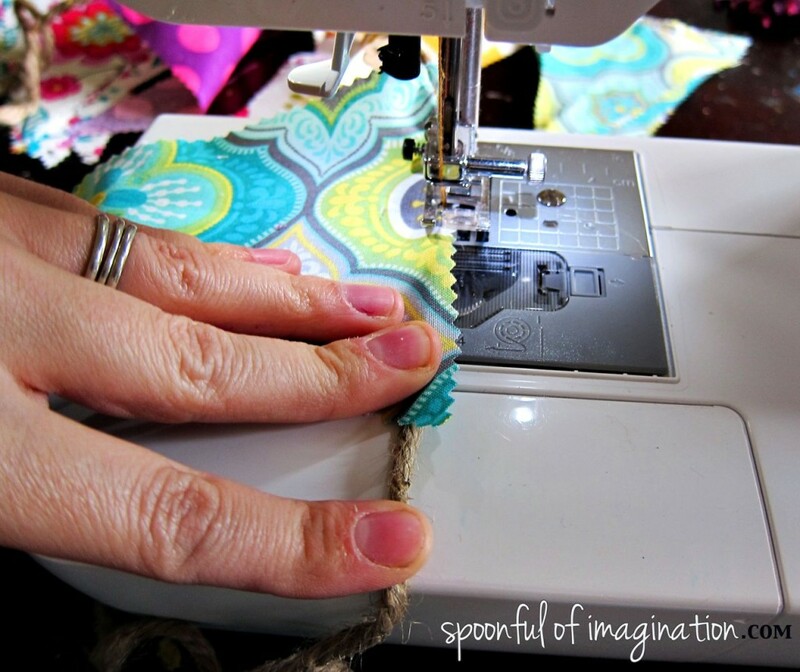 what sort of foot did you use with the sewing machine? Sam, Hahah I don’t even know the name? I am just a basic sew-er! It is the simple, basic foot that is used on most projects and came on my machine. I know I have other foots-but have never switched it out. Can you believe it!?!? Did you have to use a special kind of needle to sew through the rope? Looks great – can’t wait to try it myself.